Shots were fired Thursday night at a Tekashi 6ix9ine music video shoot with Kanye West and Nicki Minaj, TMZ reports. Tekashi and West were inside the Beverly Hills home where the shoot was taking place during what appears to be a drive-by shooting, while Minaj had not yet arrived. Police told the news outlet that they received a "shots fired" call at 10:25 p.m. and rushed to the home. Fire and ambulance services, as well as helicopter, were also called in. A source from the music video set said there were approximately eight shots fired and that no one was hit, although at least one bullet went through a bedroom window. Responders were reportedly advised that there was "armed security" on the scene. The Blast reports that police found at least five shell casings near the property in their search for evidence. After the shooting, which halted production and shook up the crew, West reportedly immediately left. Detectives are reportedly reviewing surveillance video and continuing to search nearby areas to learn more about the incident. TMZ reports that Tekashi rented the $80 million estate, located on an exclusive street in Beverly Hills, as the backdrop for the music video for one of the songs off Tekashi's new album, which features West and Minaj. The Blast reports that the home is located on Alpine Drive, which has been home over the years to celebrities like actor Gene Hackman, comedian Don Rickles, actress Donna Reed and actor Walter Matthau. Tekashi has reportedly been the subject of gang-related threats during his ongoing feuds with multiple West Coast rappers. In July, he told police that he was kidnapped, pistol-whipped and robbed of jewelry, winding up in the hospital. The New York Police Department told The Associated Press that the rapper said he was in the passenger seat of a car that was bumped by another vehicle around 4:30 a.m. Two men reportedly then got out and forced him into their car, forcing him to call another man to bring him some personal property, which he did, according to authorities. Authorities said that Tekashi became uncooperative after filing the report and then was admitted to the hospital. In a slightly different, unsubstantiated report, TMZ detailed that the rapper was accosted after driving home from a video shoot when another car blocked his driveway. 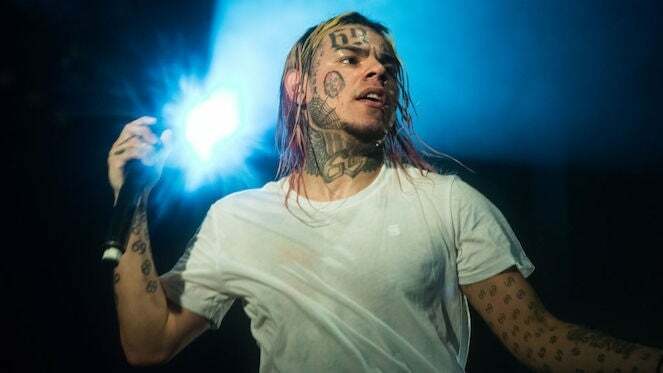 Three hooded gunmen allegedly pistol-whipped Tekashi, knocked him unconscious and carried him to their car, telling him that they'd kill him if he didn't give them money and jewelry. They reportedly returned to his home where the rapper allegedly gave them $750,000 in jewelry and between $15,000 and $20,000 in cash. The gunmen reportedly forced him back into the car and drove away, but he was allegedly able to escape by opening the back door of the car and asking a stranger for help. "No Hate," the rapper wrote on Instagram after the attack. "Charge it to the streets."